Distributor spotlight Evil Mad Scientist @EMSL « Adafruit Industries – Makers, hackers, artists, designers and engineers! Hello! 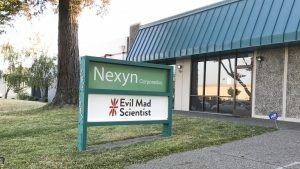 This week we are shining a spotlight onto our distributor Evil Mad Scientist! Lenore Edman and Windell Oskay started Evil Mad Scientist Laboratories as a project blog in 2006. They began selling kits and components in 2007 to support the projects. The business grew gradually and expanded from just soldering kits to include drawing machines like the EggBot, WaterColorBot, and more recently, the AxiDraw. They also distribute selected kits and components from other hardware producers like Adafruit. They are strongly connected to the open source hardware community. 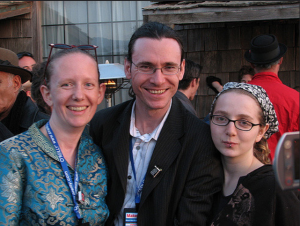 Windell was a founding board member of OSHWA, and both Lenore and Windell have been champions for open source hardware. Located in Sunnyvale, California, the shop welcomes Silicon Valley locals and visitors, in addition to shipping worldwide. Here is a photo from the second (!) Maker Faire in 2007 of Ladyada with Lenore and Windell creators of Evil mad Scientist! Check out Adafruit products at Evil Mad Scientist HERE!